Today, 9 July, marks the seventh anniversary of South Sudan’s independence, more than four years of which have been marred by conflict. Disagreement between President Salva Kiir Mayardit (of the Dinka ethnic group) and his rival, former vice president Riek Machar (who is Nuer), led to the outbreak of the conflict in 2013. Clashes quickly took an ethnic dimension, which has since become one of the main factors fuelling tensions. Other factors include poverty, famine, competition over resources and the proliferation of small arms. Defusing tribal conflict is a crucial starting point to achieving a ceasefire which can restore peace in South Sudan. Refugees from South Sudan, both women and men, can contribute positively to the ongoing search for peace mainly due to their experiences in exile, living alongside different ethnic groups. Their experiences often make them accommodating of people’s differences, and they can help change attitudes and encourage their compatriots to interact even with perceived enemies. The conflict has caused massive damage to the country, including generating one of the highest displacements on the continent, with 2.4 million refugees and another 2 million internally displaced people. In 2017, the UN Refugee Agency (UNHCR) said South Sudan’s refugee situation was the fastest-growing displacement crisis globally. Currently, South Sudanese represent the largest refugee population in Africa and the third largest in the world. Most of the refugees are hosted in neighbouring countries including Uganda, Ethiopia, Kenya and Sudan. Women and children make up the majority. Various peace agreements have been signed between opposing sides to the conflict, including the 2015 Agreement on the Resolution of the Conflict in the Republic of South Sudan and the 2017 Cessation of Hostilities Agreement, but none has succeeded. In June this year, Kirr and Machar signed the Khartoum Peace Agreement which was followed by accusations of violation by both sides. To revive the 2015 peace agreement, the Intergovernmental Authority on Development led High Level Revitalization Forum was set up in December 2017, with two meetings following in February and May 2018. The significance of the forum is its relative inclusivity as it promotes participation of diverse stakeholders, including refugees. 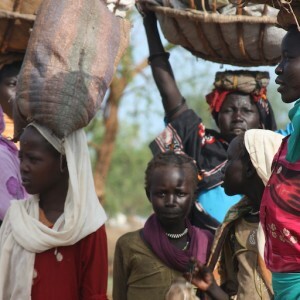 Foni J Vuni, a refugee representative at the second forum meeting, told ISS Today that woman refugees could ‘contribute towards dismantling tribalism in South Sudan, which is one of the key factors fuelling the conflict’. ‘Woman refugees [take] leadership roles to ensure survival of their families in countries of asylum. They [have] to live and work together with others from different ethnic groups and allow their children to play together and go to school, putting aside tribal affiliations,’ she said. The importance of women’s participation in the prevention and resolution of conflicts as well as peacebuilding is emphasised by the UN’s Security Council Resolution 1325 and African Union’s Solemn Declaration on Gender Equality in Africa. South Sudanese refugee women who embrace the idea of a world without ethnic boundaries can have a strong impact on the peace process. As mothers, women shape children’s identities, their perceived gender roles and socially accepted responses to conflict. Refugees’ experiences of living alongside other ethnic groups and even foreigners expand their perspectives. Access to education in countries of asylum can help prepare women to contribute even more to conflict resolution and peacebuilding. ‘At home, education opportunities for women would have been limited due to cultural norms and the civil war,’ Vuni explains. Besides offering knowledge, schools provide a good environment for women’s interaction with students from different backgrounds and countries, again reducing ethnocentrism. Even those refugees who haven’t had the chance to attend school have developed skills such as running small businesses, which involves cross-tribal interaction. Furthermore, because they must sustain their families through hard work, many South Sudanese refugee women are seen as heroes, with some achieving economic self-reliance. This also brings a great sense of empowerment which can lead to improved social status and a stronger position of influence, including in defusing tribalism. These experiences prepare refugees to become potential agents for defusing clan-based attitudes in peace processes such as the High Level Revitalization Forum. However, while allowing refugees to participate in the forum is a good gesture, it is currently limited to ‘observer’ status and their contributions are presented as part of the ‘civil society’ group. The direct engagement of refugees with big political players at the forum meetings has been limited to chance meetings in corridors and during tea breaks. Still, refugees have used those opportunities to exchange ideas and make their views heard. Given the meaningful contribution that refugees, both men and women, can make, the High Level Revitalization Forum must in future allow direct contributions and a truly inclusive process. South Sudan’s leaders must look past their ethnic differences and focus on finding common ground that can lead to a ceasefire and a restoration of peace in the country.